Even though you understand logically you are never going to be wearing the thing, it does not stop the wanting. Enter a nice little cotton/acrylic blend from long ago by Madil called DENIM. It is in a heathery taupe, the color I seem to be enthralled completely by recently (can’t escape no matter how hard I try). I’m two pattern repeats in the Back of a newly cast on Cerisara for moi, and it’s going splendidly. This is the type of lace patterning that is easy to memorize and mesmerizing to knit, all at once. You can find an identical (as far as I can tell) yarn called Kool Kotton (although this color is no longer available); the formulation and construction seems to be pretty much. (It’s a lingering curse/joke for designers that as soon as they use a particular yarn it goes missing…) DENIM & KOOL KOTTON are also a lot like a Sirdar offering awhile back called BREEZE (that I made the Basic Chic Pulli sample from and Nicole). If you have some of that lingering in your stash it would be so very nice. Any way, it is also quite inexpensive. In the size 38, which I’m making, the cost comes in at about $28.00. For the whole thing. Nice. Another really nice cotton blend is Plymouth JEANNEE DK — again coming in around the 30.00 mark for supplies. This list is full of both wool & cotton offerings that work well with this pattern. For some newer yarns, this is a style that uses DK weight yarn bumped up to a worsted weight gauge to make a fabric with gorgeous, but not out-of-control, drape and stitch definition. I used something called Eucool for the sample sweater, that is a very lightweight yarn made from wool and get this: eucalyptus! I fantasized about the days I used to live on the coast of Northern California where we had so many of these trees (I am very sentimental)! Other beautiful yarns that work well: Silky Wool, Felted Tweed DK, Rowan Cashcotton, Lempur Linen, & Wool/Cotton, Classic Elite Soft Linen, Hempathy, etc. Oh, and Blue Sky SKINNY COTTON (oh please, the Mallard color just rocks)! Cerisara is a lovely flattering cardigan with simple-to-knit lace detailing and exquisite finishing. Knit in one piece, from the top down, using DK weight yarn knit at a worsted gauge. Instructions included for both long sleeves and a sleeveless vest version. 34 (38, 42, 46, 50, 54) "
Find out what many chic knitters have already discovered from a sold-out edition of Interweave Knits! Now available as a PDF Download with Expanded Sizing and Sleeves! Aleita is a great piece for coordinating with your work or play wardrobe. It has subtle ribbed texture without binding, flattering shaping and ingenious finishing. Instructions are included for a Sleeved & Sleeveless version made with worsted weight yarns at a 2028 gauge in wool or cotton. What’s more fun than doing taxes? 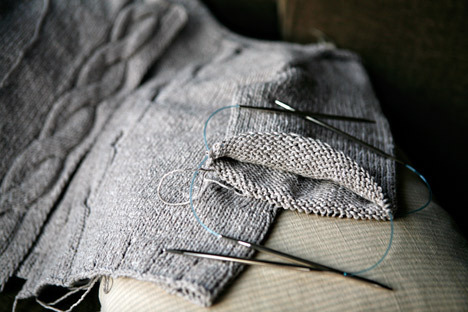 Thus, I’m zooming right along with my Mondo Cable Cardi Sleeve #1 and it’s about six inches long now. A couple of weekends ago, I picked up some blue-cable Addi turbos and they are really speedy! My old ones are stuck in some other projects and besides, they have this stiff crudtastic cable that drives me crazy when I do this technique. 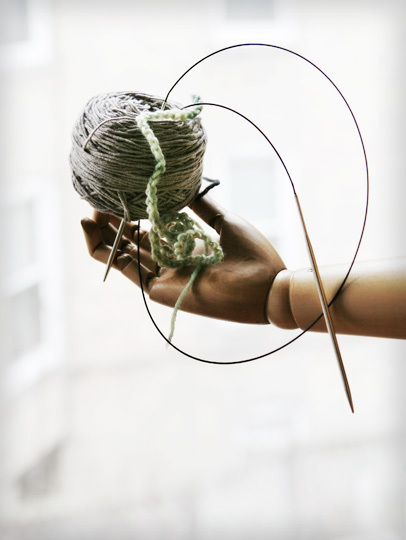 Knitting in the round with two circular needles can go very fast or be maddeningly slow if the cables are not really flexible (or, as I found out recently, the joins in the tips is chipped and snags). But these must be a new & improved version and are working way beyond my expectations.